A few weeks ago I bought Jo Wheatley’s new book Home Baking and whilst flicking through it, came across this scarily simple but impressive recipe. My workmate Tracy requested cheese and biscuits over cake for her office birthday celebrations last week so I thought it would be a good opportunity to try out this recipe and use up some of my homemade caramelised red onion chutney. The original recipe calls for 2 tbsps of chutney but I doubled the amount as it didn’t seem to go far. You could also use a thin layer of chilli jam and Cheddar or Marmite and Gruyère for different flavours. Preheat the oven to 190c or gas mark 5 and line a large baking sheet with parchment. Roll out the pastry into a rectangle 3mm thick and spread the chutney in a thin but even layer. Sprinkle the Cheddar on top of the chutney. Lightly mark with a knife the middle of the two shorter sides and roll tightly from the long sides into the centre using the marks as a guide. Wet the pastry where the two rolls meet and gently push together to seal. Using a sharp non serrated knife trim each end in a clean chop rather than a sawing motion (the pastry should be cut cleanly to ensure an even rise) and then cut 1.5cm slices placing each palmier cut side down on the baking sheet allowing space for them to expand slightly. 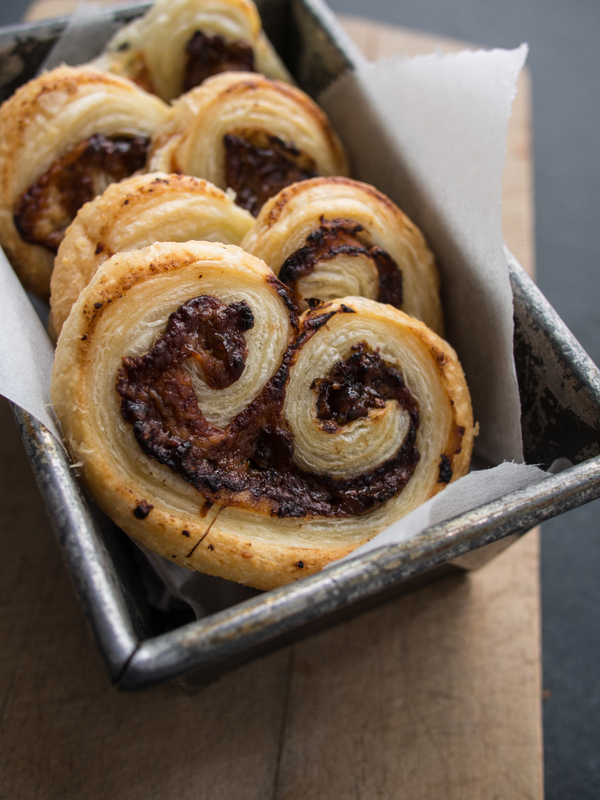 Flatten each palmier slightly with the palm of your hand and then chill in the fridge for 10-15 minutes before baking. 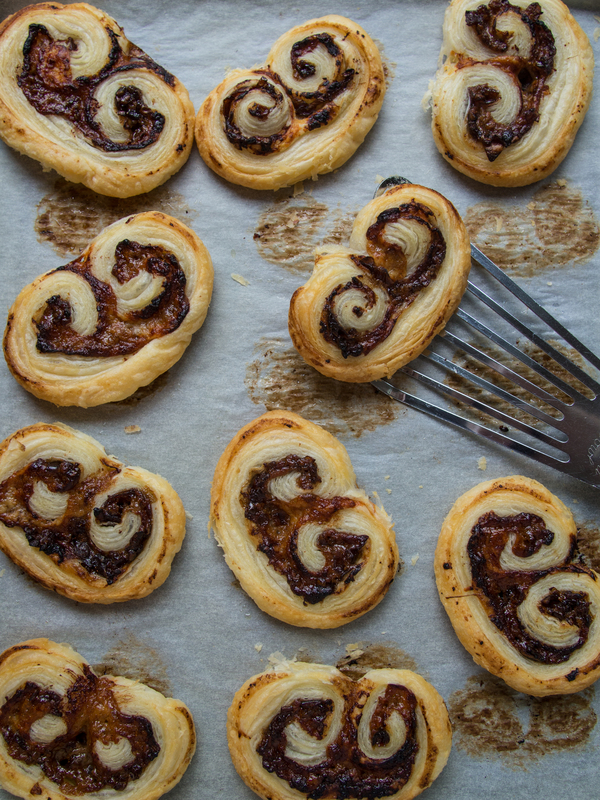 Place the sheet of palmiers in the oven for 15 minutes until caramelised and golden. I had a few red onions to use up, so I made caramelized onions, after which I looked for a recipe that called for caramelized onions and found this one. Delicious! I used a store-bought puff pastry sheet (the frozen ones you thaw right before using), 5 Tbs caramelized onions, and aged cheddar. It needed to be baked almost 20 minutes. Definitely best eaten warm.